I don’t use a crockpot nearly as much as I should. It’s a super easy way to plan dinner when you don’t have a lot of hands-on time. That isn’t the only reason, it’s a great way to infuse flavors. Years ago the only tacos that I made were with ground beef seasoned with a spice packet called taco seasoning. It was a quick meal and we loved them until we had a taste of what a better taco tasted like. We loved going out and trying other Mexican dishes that at the time I had no clue what was in them. So when I started making a lot of our own shredded chicken tacos at home, I wanted a flavorful spice combination that infused the meat and didn’t just get boiled into it. This chipotle recipe was the way to go! What is Chipotle? Chipotle is a jalapeno pepper that has been smoked. The Aztecs found that the jalapeno doesn’t dry as well as other peppers because of it’s thicker walls so they smoked them as a way to preserve them. Is Chipotle spicier than a jalapeno? Generally yes because Chipotle is made using a red, fully ripened jalapeno. What is adobo? Adobo can have separate meanings. We’re referring to the spicy sauce that’s intensely red due to paprika. This chipotle marinated in this sauce is called Chipotle in Adobe sauce and is what’s used here. This Chipotle Chicken recipe is spicy enough for my tastes. That isn’t the case with John. I swear he has a cast iron stomach. The heat in these tacos comes from Chipotle Chilies in Adobo. The heat (spice level) can be adjusted according to what you like. 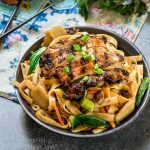 How do you make the chipotle paste for this recipe? Chipotle peppers are combined with additional spices, onion, and cilantro and then made into a paste using a blender or food processor. The can of Chipotle in Adobe sauce has about a dozen chipotle peppers in it. This chipotle chicken recipe uses 3 chilis in the shredded chicken taco meat but I double the paste ingredients to use up the whole can of chipotle peppers. Then I’ll put some in the refrigerator so ole cast iron stomach can smear more on his taco and freeze the rest for the next time I want to make these tacos. If you like using avocado in tacos or sandwiches, mash them into a spread. I find that it helps keep all of your goodies in the taco shell or sandwich. Sliced avocado tends to slide right out taking the remaining ingredients with it. Mini Food Processor – I use this little powerhouse for chopping and blending smaller quantities so I don’t have to use my much bigger and heavier food processor. Boxed Grater – I grate my own cabbage, lettuce, and cheese. The convenience packages of cheese have non-clumping ingredients and everything tastes so much fresher when you do it yourself. It doesn’t add that much time. If you like this recipe leave me a comment below and 5-✭✭✭✭✭ rating. Crockpot Chipotle Chicken Tacos are loaded with spicy juicy shredded chicken. The crockpot makes them a hands-off recipe that everyone will devour. Combine paste ingredients and process in a blender or food processor until a thick paste form. Mix the paste with the chicken. Cook on high for 4 hours or up to 8 hours on low. Shred chicken with two forks. Allow the shredded chicken to sit in the liquid until the liquid is absorbed. Serve with taco garnishes of your choice. I actually mash the avocado and add diced tomatoes, green onion, cilantro and a bit of salt. It helps keep all of the goodies in the taco. The only thing that these crockpot chicken tacos need is a great Margarita to go with them! Thank you Al! 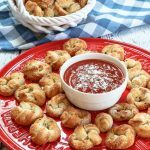 This is one of my favorite recipes too! I appreciate you leaving me a note letting me know that you tried them. I really enjoyed this recipe. I made a couple of small changes to make it spicier, but otherwise I thought it was fab ! Thank you so much for your wonderful comments and great rating! This CROCKPOT CHIPOTLE CHICKEN TACOS is so perfect for taco tuesday!!!! YUM! Taco Tuesday never looked so good!! Seriously drooling over here!! Thank you! 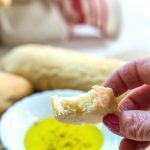 I love easy recipes like this one! I am all about tacos even if it isn’t Tuesday! 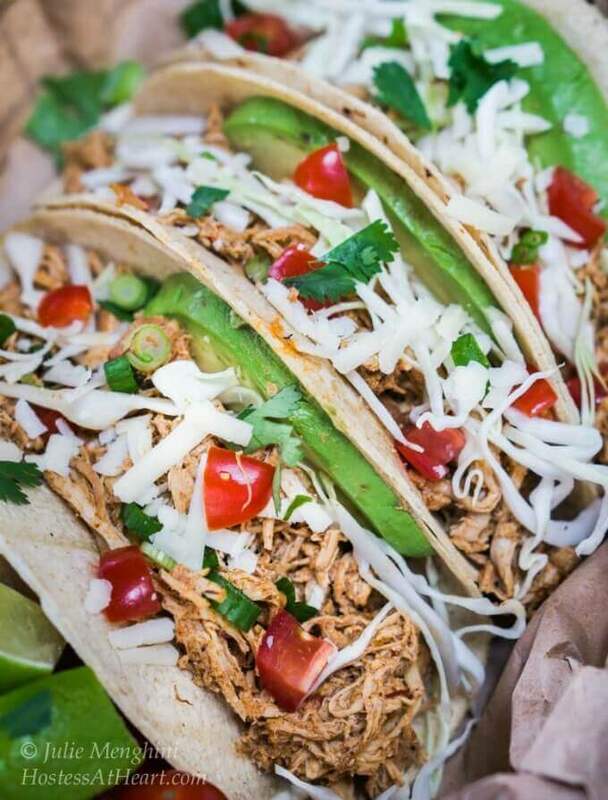 I think we should have tacos for every day of the week. A crock pot makes it even better! Thank you! What did we ever do without that trusty crockpot? I could easily eat tacos once a week if they looked like this! So delicious looking and packed with flavor. Thank you Christie! I love easy make it and forget it recipes. Thank you, Ashlyn! I don’t know how we got buy before the crockpot was invented! This makes me seriously want tacos for dinner tonight! These tacos look incredible and sound like they’re full of so much flavor! Ive got this all set up for my husband to put in the crockpot this week while Im away! It was easy to put in a bag and have it ready for him to set up….. It sounds so good and I cant wait to have some leftovers when I get back! I hope you loved it! Thanks, michele! Ha! I would be with John – lighting my food on fire and piling on the jalapeños! I’m loving these easy tacos – what a delicious meal. Slow cooker meals are always a hit here! Thanks Debra! I’m a WHIMP! We have tacos at least once a week and most every ingredient is in our pantry. So, these will go in rotation very soon! Woo hoo thank you Rob! I hope you’ll let me know what you think. We loved them. Enjoy your evening and thanks again for stopping by! Haha! I think we live off of our crockpot so this recipe would fit in or me and my family really well. Thanks for sharing! My mouth is watering looking at these! I am crazy about tacos. I’m going to pin this. Thanks again for sharing at FF #117! 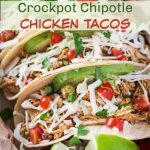 My husband is a huge taco fan, but I’m tired of the traditional ground beef tacos, so I love the idea of crockpot shredded chicken. Pinned for later! Thank you Lily! We eat fish tacos too. Sounds delish and perfect for Cinco de Mayo!! Thanks for bringing this to Fiesta Friday! Thank you so much! I appreciate you co-hosting! Have a wonderful FF and weekend! That sounds like one truly delicious paste in with your chicken and your photos are drool worthy. Yum! I love tacos (I get Rick Bayless’ Taco Tuesday emails every Tues. if you’re interested) and I love to use my slow cookers all year long. Your recipe looks really good – I would have to do a taste test to see if I wanted more chiles. Thank you Judi! I didn’t know about Rick Bayless Taco Tuesday emails. I’ll have to sign up. I need to use my crockpot more! 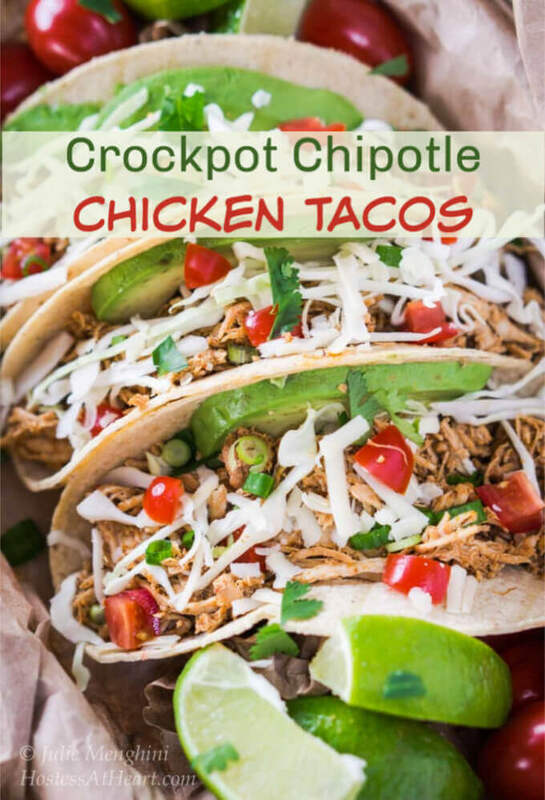 Josette (The Brookcook) told me about them – Rick posts a different taco recipe every Tues.
Julie, these tacos rock and so simple that you made them in the crock pot. I need to get a crock pot just so that I can cook your recipe. Gorgeous photos pinning and sharing! Thank you! The oven would work too, but it heats the house up in the warmer weather so treat yourself! Have a wonderful day! Thank you so much Ivette! You are so sweet to nominate me. My fellow bloggers mean the world to me. Thank you so much for acknowledging me with this nomination. Hugs! Wow, these look fabulous! I will absolutely try these! Thank you Annie! I hope you’ll let me know what you think! Wonderfully spicy and savory tacos Julie. I find anything you put in the crockpot becomes a great meal for shredding, even pork. Love the chipotle flavors, and I like the idea of mashing up the avocado. The great thing about a crock pot too in the summer time, is it does not heat up the kitchen. I tend to leave out the curries in the summertime as it is so hot, but I’ve since cooked it twice in a slow cooker, and it has been amazing! So looking forward to cooking it every so often in my crockpot. Do you use a special type of tortilla for your tacos? Thank you Loretta! We cook outside a lot in the summer. I don’t like heating up the kitchen either. I’ve found taco shells at my grocery store that aren’t cooked called tortilla land. We really like them a lot. Great flavours! I know my menfolk would love this…I take it I could replicate it in the oven? Thank you Elaine! Yes you could. I think most recipes from a crock pot can be made in a covered pot in the oven. This will be another favorite with my sons. Yum! I thought of you Johanne! I know they will like this one. 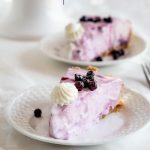 You can make a boat load of this stuff and put it in the freezer for when those boys need fed. You know us too well Julie! Thanks Jess! Ha! Our stomachs think alike. I love food like this when it gets a little nicer out. I need to use that crock pot more too! These look absolutely wonderful, Julie! I love everything about them. Chipotle peppers are one of my favorite things, and I love all the spices you incorporated into the meat. Yum! Pinning to make soon! Thank you Shari! Did you ever get a chance to try the dry rub? I put it on boneless skinless chicken thighs last week and used them on salads for lunch. I didn’t yet, but still plan to. Last week just got crazy for me. By the way, do you coat the chicken in oil first? Spicy tacos are a hit in our house and your chipotle chicken ones sound great. Thank you Karen! We enjoyed them and they freeze well too. I love using my Crockpot! And boy do we love tacos in our house. I see this in our very near future 🙂 Pinned! Thank you Sarah! They freeze well to so you can make a bunch and freeze the rest for a busy day. Thank you James! Home up for sale yet?